has claimed its place at the forefront of contemporary interior style. There’s no question that Scandinavian design has been at the forefront of contemporary interior style for the past few years—between hygge-heavy winter style guides and the light, bright aesthetic of the latest architectural designs, Scandinavia is well represented in the design world. But while Scandinavian design may seem like a passing trend, its history tells a different story. Having dominated regional design for more than 50 years in northern Europe, it seems this style is finally getting the worldwide recognition it deserves. With clean lines, functional design and emphasis on all things cozy, this design style stands out as one that is universally appealing. Here, we’ll show what defines Scandinavian spaces, the history of the aesthetic movement, and what the future of Scandinavian design looks like. What style tenets define the elegant Scandinavian aesthetic? Of course, the word hygge must be mentioned, as it has become a popular look referring to the cozy, bright interiors of Scandinavia. The long, dark winters of northern Europe can make many people melancholy, so they compensate for outdoor conditions by creating bright, warm spaces inside. Light colored walls are a necessity for a true Scandinavian interior, which allows a room to feel more expansive and bright, even after the sun goes down. Further, Scandinavian architecture embraces open floor plans with flexible, multi-use rooms. One room might serve as a living room and a dining room, with sofas and a dining set. Neutral colors are typical in Scandinavian homes; grays, creams and white tones are favored over more colorful options. If color is involved, it’s typically in light or muted shades, rather than saturated jewel tones. The most important, often-unsung aspect of Scandinavian design is the heavy reliance on lighting. Homes are flooded with light from a variety of sources: Overhead lights provide even light, which is then layered with smaller pools of light brought by additional pendants or sconces and, of course, candles. All that lighting welcomes visitors in from the cold winters and allows spaces to feel warm and cozy without the use of bright colors. Today’s Scandinavian design style emerged during the same period as Modernism: the 1950s and ‘60s. Designers around the globe were considering the significance of new manufacturing processes that could make high-quality furniture more affordable and accessible for the middle class. Scandinavian designers embraced this mindset, but added an additional component: Creating furniture that was accessible, affordable and flexible would allow people to purchase fewer, better quality pieces. This set of ideals was termed “Functionalism,” and it resulted in the creation of many furniture pieces that are considered classics today. It is easy to see the parallels between Modernism and Scandinavian Functionalism: both embrace clean lines, sleek frames and harmonious balance. But there are some differences between the two: Scandinavian design plays to pale, neutral colors and wood tones, whereas Modernism favors darker woods like walnut and colors like mossy greens and burnt oranges. The two aesthetics certainly play well together, however, and can easily merge in a modernist space. Many classic pieces of Scandinavian design are still beloved in contemporary design circles. For example, Poul Henningsen’s Artichoke Pendant remains a classic design that is as coveted today as it was at its creation in the late 1950s. Designs by the pioneering Finnish designer Alvar Aalto, like the Aalto Vase, also look relevant and fresh despite being created more than half a century ago. While classic Scandinavian design remains relevant in modern interiors, new and innovative designers are leading the way in creating new pieces that reflect the past and future of Scandinavian style. 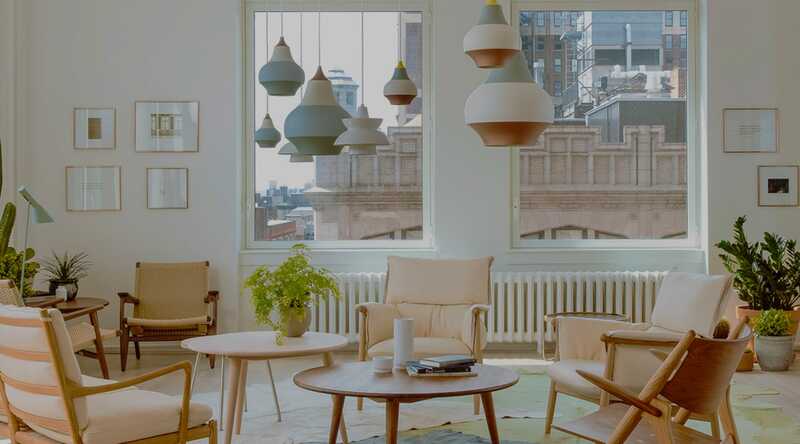 Brands like Muuto, whose soft, playful designs have received global recognition, are giving the world access to Scandinavian design. Other brands of note include Menu, a quirky brand that produces everything from lighting to laundry bags, and Cane-Line, whose distinctive outdoor furniture pieces are as streamlined as they are comfortable. Paint your walls pale. White and light tones brighten up interiors to make for open, airy rooms. Lighten up your wood. Find wood flooring and furniture pieces in bleached tones to compliment lightened walls. Flood your space with lovely light. Layer multiple light sources for cozy, welcoming warmth. Invest in quality pieces. The multifunctional nature of Scandinavian furniture favors having fewer, higher quality pieces, which leaves more space open for light and air. Maintain minimalism. Uncluttered surfaces and a less-is-more philosophy are hallmarks of Scandinavian spaces. Utilizing storage solutions like cabinets and cupboards are an effortless way to keep spaces clear and clean. Embrace coziness and candles. The two easiest items to include in your home for optimal hygge? Candles and blankets. Try lighting a few tealights in the evening and see the difference additional lighting makes. Wrap up in a blanket, and you’re well on your way to Scandinavian bliss.